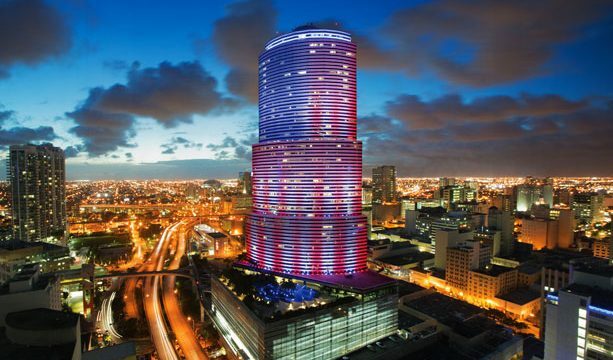 Miami Tower: The colorful skyscraper, headquarter of TotalBank, is currently for sale! Is not unusual that international financial entities decide to invest in Miami and establish their business in many cities of the United States. “Total Bank” is a financial institution acquired by “Popular Spanish Bank” for 243 million dollars and is currently operating in the grand “Miami Tower” since 2007. From that moment its asset’s value has increased from 1.43 to 2.93 billion dollars until the end of June 2016. This magnificent 47 levels tower located in Downtown Miami, is positioned as the eighth higher skyscraper of the town and Florida state. It was designed by “Pei Cobb Freed & associated” which incorporated among their attributes, a sophisticated night light system that accompanies most of the thematic holidays. Also its three levels of crystal design, set the standards like no other. “Miami Tower” is the first skyscraper to include a subway station elevated inside its architecture; the “Knight Center Station”, making it more accessible to the public. At the same time, it has a lobby in the 11th level covered of marble and gold, accompanied by natural environments like a big outdoor terrace of 930 square meters. For its customers delight, this magnificent building has a modern gym equipped with mahogany accessories. In addition, it’s connected with “James, L. Knight” cultural complex where each year take place cultural, politics and business events, providing great advantages to the location of this imposing structure. Definitely, its architecture, location and design generates the best environment to invest and buy Miami business for sale. It has been headquarter of famous Miami retail spaces and banks like ”Bank of America”, “Nations Bank” and “CenTrust” . In this sense, “Miami Tower” become a potent space to establish business activity centers. 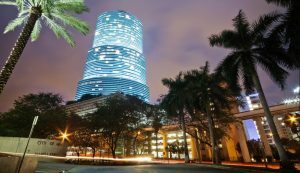 Since “Miami Tower” was offered for sale, it has received several proposals from local buyers who take advantage of the dollar strength to increase their stock of Miami offices. Also from international buyers of countries with strong economies, who take the chance to grow and expand their projects in Miami, aspiring to obtain the best performances in all of their investments.